How to watch My Little Pony: Friendship Is Magic: Season 6 (2018) on Netflix Portugal! Sorry, My Little Pony: Friendship Is Magic: Season 6 is not available on Portuguese Netflix, but you can unlock it right now in Portugal and start watching! With a few simple steps you can change your Netflix region to a country like Pakistan and start watching Pakistani Netflix, which includes My Little Pony: Friendship Is Magic: Season 6. We'll keep checking Netflix Portugal for My Little Pony: Friendship Is Magic: Season 6, and this page will be updated with any changes. 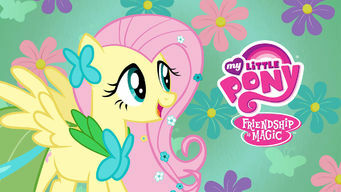 My Little Pony: Friendship Is Magic: Season 6 is not available in Portugal BUT it can be unlocked and viewed! Season 1 of My Little Pony: Friendship Is Magic has 26 episodes. Because different Netflix countries have different availability for episodes, you'll need to check the episode listing below to see which are available in Portugal. After attempting to warn Princess Celestia about the return of wicked Nightmare Moon, Twilight Sparkle and Spike travel to Ponyville. Nightmare Moon challenges the ponies with obstacles they must overcome to find the Elements of Harmony before it's too late. When Twilight Sparkle receives two tickets from Princess Celestia to the Grand Galloping Gala, all her friends want to go. Whom will she choose? 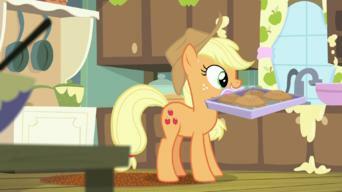 It's Applebuck season in Ponyville, and a short-handed Applejack is determined to complete the harvest all by herself. Pinkie Pie and Rainbow Dash pal around, but when Dash's old friend Gilda the Griffon shows up, Pinkie Pie suddenly becomes a third wheel. Trixie, a boastful pony with magical skills, arrives in Ponyville and irritates the other ponies, who try to get Twilight to challenge her. Fluttershy must convince a sleeping dragon to move out of town before the plume of black smoke it's producing covers all of Equestria. When the ponies gather at Twilight's for a slumber party, Rarity and Applejack begin a quarrel that threatens to ruin the party. When the ponies are afflicted with bizarre and humorous illnesses, they accuse a mysterious zebra named Zecora of placing a curse on them. The ponies must rescue Ponyville when little multiplying creatures called Parasprites descend upon the town and begin to devour everything. Twilight Sparkle does her very best to prepare for the upcoming annual winter clean-up without relying on her magic to help. Discouraged because she has not yet received her cutie mark, Apple Bloom searches out her purpose in life so that she can get her special symbol. When Rainbow Dash and Applejack compete against each other in the annual Running of the Leaves, each pony will do whatever it takes to win. Rarity makes dresses for her friends for the gala, but she gets in over her head when she tries to incorporate all of their individual styling ideas. Amazed with Pinkie Pie's ability to predict the future, Twilight Sparkle follows her around to find the source of her incredible abilities. When Rarity gets magical wings so that she can watch a race, she is so taken with her new ability that she disrupts the competition. Fluttershy offers to baby-sit the Cutie Mark Crusaders, but she quickly discovers that they are more than she can handle. The Cutie Mark Crusaders sign up for a talent show, hoping to discover their special talent in life and finally earn their cutie marks. While hunting in the woods for gems for a new dress, Rarity is taken by a group of greedy Diamond Dogs and forced to find jewels for them. Rarity recruits Fluttershy as a model to impress a famous designer with her dresses, but it's Fluttershy's modeling career that takes off instead. The ponies work to settle a complicated land dispute between the Apple-loosans and a herd of buffalo fighting over the same territory. Without asking permission, Fluttershy borrows the Princess' sick bird in order to heal it. Now, the ponies must get it back before she notices. The Cutie Mark Crusaders seek out Twilight and the rest of the ponies to learn the stories of how they got their cutie marks. When Twilight becomes friends with an owl who helps her with chores around the house, Spike gets jealous and fears he will be replaced. 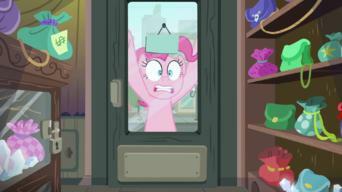 Confused and discouraged, Pinkie Pie goes on a mission to find out why her friends are avoiding her most recent party invitation. Expectations are high for the Grand Galloping Gala, but when the ponies arrive they find that the event isn't all they had hoped for. Season 2 of My Little Pony: Friendship Is Magic has 26 episodes. Because different Netflix countries have different availability for episodes, you'll need to check the episode listing below to see which are available in Portugal. When Discord, the spirit of chaos, escapes from his imprisonment in stone, Twilight and her friends must defeat him using the Elements of Harmony. When Discord causes a rift between the six friends and renders the Elements of Harmony useless, Twilight must rekindle their friendship. 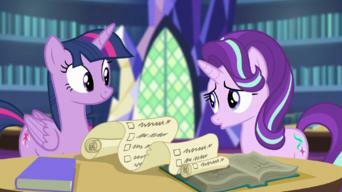 Hyperorganized Twilight panics when she can't find a lesson about friendship for her weekly letter to Princess Celestia. Nightmare Night's macabre celebrations are in full swing when Luna herself shows up in Ponyville, determined to change her frightening public image. Sweetie Belle disowns Rarity as her sister when she refuses to participate in a rough-and-tumble celebration of sisterly unity. Apple Bloom finally gets her cutie mark! But joy turns to panic as she gets a second, then a third, then a dozen cutie marks. 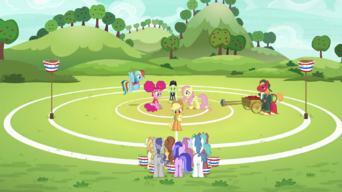 Rainbow Dash holds a flying race to determine who will win the honor of being her pet. A new masked avenger steals Rainbow Dash's thunder as Ponyville's resident hero. During a trip to Canterlot, Rarity has to choose between the important social connections she's made in the capital and her uncouth Ponyville friends. Spike's birthday gifts activate his greedy dragon instincts, causing an outrageous growth spurt that threatens to destroy all of Ponyville. The six friends put on a play that illustrates how unicorns, pegasi and Earth ponies put aside their differences and founded Equestria. Apple Bloom does everything she can think of to stop Granny Smith from speaking to her class and causing her everlasting embarrassment. Pinkie Pie takes on the task of babysitting the Cakes' twin toddlers, but she finds that she's woefully unprepared for the challenge. The friends travel all over Equestria to track down Applejack, who has mysteriously disappeared after attending a rodeo competition in Canterlot. 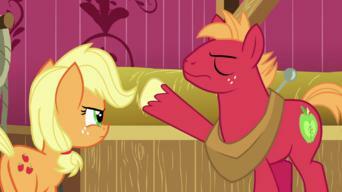 The future of Sweet Apple Acres is in peril when the Apples challenge the Flim Flam brothers to a cider-making contest. The winner takes the farm! 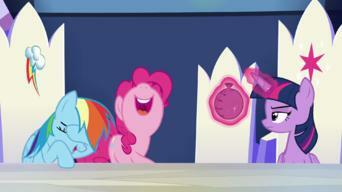 After mocking it as an egghead pursuit, Rainbow Dash discovers the joys of reading while laid up in Ponyville Hospital. The Cutie Mark Crusaders create a love potion to make Cheerilee and Big Macintosh fall in love, but they quickly regret their actions. Pinkie Pie is confused about what to do when she meets Cranky Doodle Donkey, the first creature to ever refuse her offer of friendship. After being pushed around one too many times, Fluttershy gets some assertiveness training, but then she becomes a bully herself. Twilight drives herself to distraction trying to prevent some future disaster after she receives a vague warning from her future self. Spike goes on a journey of self-discovery by joining the Great Dragon Migration. But can a rough-and-tumble gang of teenage dragons really help him? Fluttershy struggles to overcome her fear of public humiliation so she can help Rainbow Dash and the other pegasi get water to the city of Cloudsdale. 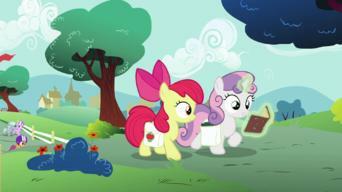 The Cutie Mark Crusaders are excited to write the school paper's gossip column. But is it worth the pain they cause with their hurtful stories? 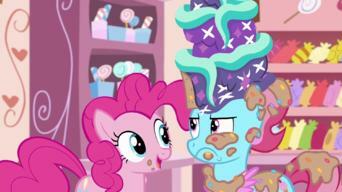 Pinkie Pie starts the silliest criminal investigation in the history of Equestria when a cake she is guarding gets destroyed on the way to Canterlot. Twilight is confused by her conflicting feelings when she finds out that her brother, Shining Armor, is going to marry Celestia's niece, Mi Amore. Twilight saves all of ponykind by freeing the real Mi Amore and defeating Queen Chrysalis, a changeling who had assumed Mi Amore's appearance. Season 3 of My Little Pony: Friendship Is Magic has 13 episodes. Because different Netflix countries have different availability for episodes, you'll need to check the episode listing below to see which are available in Portugal. Princess Celestia sends Twilight Sparkle to the wintry north to protect the magical Crystal Empire from being taken over by the wicked King Sombra. As King Sombra gains power, Twilight Sparkle searches for a powerful artifact that will destroy the tyrant and protect the Crystal Empire forever. In order to have more fun, Pinkie Pie clones herself over and over again, until even her friends can't tell which one is the real Pinkie Pie. The ponies are eager to welcome Apple Bloom's cousin, Babs Seed, when she comes for a visit, until Babs turns out to be a bully. When they discover that a magic amulet has gained a strange power over Trixie, Twilight's friends set out to save her from its sinister spell. When scary campfire stories give Scootaloo nightmares, she must face her greatest fear of all: admitting to her friends that she's afraid. Rainbow Dash is thrilled to attend an elite academy until she discovers that the school encourages its students to behave recklessly. Spike arranges to watch over the pets of Twilight Sparkle and her friends while they're away, but the critters are more than he can handle. When Granny Smith lets her plan the next Apple family reunion, enthusiastic Applejack gets carried away and loses sight of the event's true purpose. After Applejack saves him from a vicious wolf attack, Spike tries to repay the debt, but his endless efforts to be helpful only cause more problems. At Princess Celestia's request, Fluttershy befriends Discord so she can help him change his ways. But can the troublemaker ever really be trusted? At Princess Cadance's request, Twilight and her friends try to convince a special envoy that the Crystal Empire should host the next Equestria Games. As she tries to reverse the magic of a spell that mixed up her friends' Cutie Marks, Twilight Sparkle unexpectedly discovers her own destiny. Season 4 of My Little Pony: Friendship Is Magic has 26 episodes. Because different Netflix countries have different availability for episodes, you'll need to check the episode listing below to see which are available in Portugal. Twilight Sparkle has an important new role in the Summer Sun Celebration. 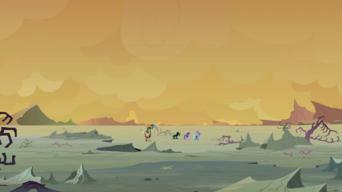 But the plans are postponed when Princess Luna and Princess Celestia vanish. To stop the Everfree Forest from taking over all of Equestria, Princess Twilight and her friends must bring their elements to the Tree of Harmony. At Luna and Celestia's old castle, the ponies let their imaginations run wild and become convinced that the place is haunted. When the latest volume in the "Daring Do" series is delayed, Rainbow Dash and her friends offer to help the author so she can finish the book. 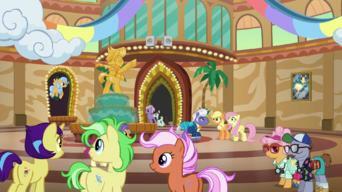 The Cutie Mark Crusaders compete for the honor of carrying the Ponyville flag at the Equestria Games. After Spike and the Mane 6 become superheroes in a comic-book world, the only way to get back home is to defeat a supervillain known as the Mane-iac. When vampire fruit bats take over Sweet Apple Acres, Applejack's efforts to get rid of them take an unexpected and frightening turn. When Rarity goes to Fashion Week, she generously gives some fabric to another designer -- who uses it to copy Rarity's entire line. When Pinkie Pie learns she may be related to the Apple clan, she joins them on a trip to visit a relative who can offer proof that she's their cousin. At the Equestria Games trials, Rainbow Dash is offered an opportunity to join a relay team with a better chance of winning than the Ponyville crew. When a sick friend shows up needing Twilight's attention, her plans for quality bonding time with her sister-in-law have to be put on hold. Pinkie Pie's status as super-duper party pony is at risk when the mysterious Cheese Sandwich comes to town and offers to plan a bash for Rainbow Dash. Rarity has a crush on a travel writer but soon finds herself competing with Applejack for his attention. When a member of the singing group the Ponytones has to miss an important concert, Fluttershy takes drastic measures to make sure the show goes on. After Twilight offers to help the Cutie Mark Crusaders with their studies, the three fillies try to use the relationship to increase their popularity. When some tiny, magical creatures called Breezies get into trouble as they're migrating home, Fluttershy swoops in to save them. After leaving Apple Bloom home alone for the day, a series of unfortunate accidents causes Applejack to regret her decision. When her sister Maud comes to Ponyville, Pinkie Pie wants her friends to bond with her sibling -- but it turns out to be harder than they expected. After Rarity steals the spotlight from Sweetie Belle, she deliberately sabotages a costume for one of Rarity's most elite clients. A miracle, cure-all tonic has the Ponyville ponies eager to spend their hard-earned money for a chance to be rid of their ailments. Rainbow Dash prepares to take a test on the history of the Wonderbolts -- an exam she must pass to become a member of the Wonderbolts Reserves. 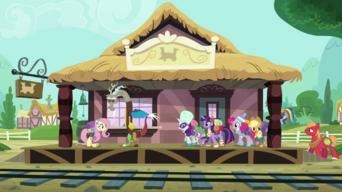 Spike and the Mane 6 head to the Rainbow Falls Traders Exchange looking to swap something they no longer want for something they value. 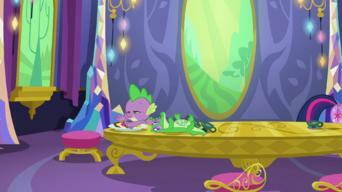 When Rarity loses her creative mojo, Spike finds a spell that makes all of her ideas materialize. 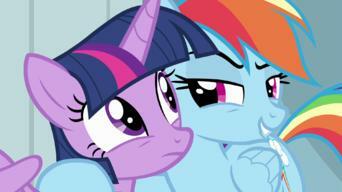 But they soon have a negative effect on Ponyville. 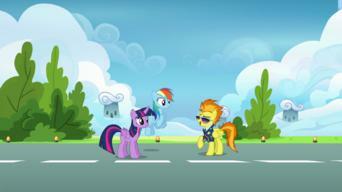 When Spike is given the honor of lighting the torch to open the Equestria Games, his nerves get the best of him. When Princess Celestia picks Discord instead of Twilight to hunt down a villain, she turns her thoughts to the chest she got from the Tree of Harmony. To protect their magic and Equestria's fate, Princess Celestia, Princess Luna and Princess Cadance transfer all their powers to Twilight. 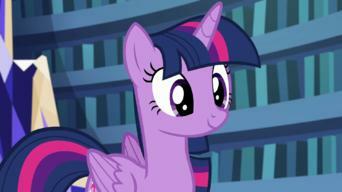 Season 5 of My Little Pony: Friendship Is Magic has 26 episodes. Because different Netflix countries have different availability for episodes, you'll need to check the episode listing below to see which are available in Portugal. The Mane 6 go on a mission to a seemingly happy village, where head pony Starlight Glimmer has convinced everyone to give up their Cutie Marks. The Mane 6 need to retrieve their stolen Cutie Marks, expose Starlight Glimmer’s secret plan and help the town’s citizens regain their individuality. When Twilight's friends discover that she's been avoiding her new castle, they work together to decorate it so that it resembles her beloved old home. Apple Bloom is so anxious about earning her Cutie Mark that she has a series of frightening nightmares, but her friends help her deal with her fears. Rainbow Dash is so upset that Tank, her pet tortoise, has to hibernate for the winter that she tries to control the weather and stop the coming cold. When infamous outlaw Troubleshoes Clyde returns to the Appleoosa rodeo, the Cutie Mark Crusaders discover that he may not be such a bad guy after all. When Discord learns that Fluttershy is taking a new friend to the Galloping Gala instead of him, he goes to extreme lengths to prove he isn't upset. Rainbow Dash and Pinkie Pie are sent to the kingdom of Griffonstone, where they have differing ideas about what problem they've been sent to fix. It's chaos in Ponyville as the Mane 6 battle a bugbear, and Cranky Doodle Donkey and Matilda realize that a printing error might ruin their wedding. Spike shoos away visitors while Twilight rests after an important meeting, but the power of making decisions for the princess goes to Spike's head. When a friendship summit with the yaks goes wrong, it's up to Pinkie Pie to make an epic voyage and find a way to help appease the angry visitors. When Twilight realizes what a bad friend she was before moving to Ponyville, she goes with Spike to Canterlot to make amends to her former friends. Princess Luna enlists the Mane 6 to track the Tantabus, a magical force that threatens to turn the dreams of everyone in Equestria into nightmares. Although Rarity's dream of owning a beautiful boutique has finally come true, her success comes with a price she isn't sure she's willing to pay. Determined to overcome her timidity and face her fears, Fluttershy decides to participate in the scary fun of Nightmare Night with her friends. When Rainbow Dash is accused of a crime she didn't commit, it falls on Rarity to investigate the case and prove that her friend is innocent. Applejack and Rarity travel to Manehattan to help Coco Pommel with a major project but soon discover that they've bitten off more than they can chew. Season 6 of My Little Pony: Friendship Is Magic has 26 episodes. Because different Netflix countries have different availability for episodes, you'll need to check the episode listing below to see which are available in Portugal. The Mane Six attend a ceremony honoring the birth of a foal to Princess Cadance and Shining Armor, while Starlight gets a lesson in friendship. When the cries of the newborn alicorn foal shatter the Crystal Heart, the Mane Six desperately search for a spell to restore it and save the kingdom. Pinkie Pie travels to Manehattan with Rarity in search of the perfect gift for her sister Maud Pie: a nice pouch for Maud Pie's pet rock, Boulder. When they finally get their cutie marks, the Cutie Mark Crusaders are unsure what to do next until tap dancer Tender Taps shows them the way. Spike reluctantly enters the Gauntlet of Fire, a competition to determine Torch's successor, in order to prevent Garble from becoming Dragon Lord. Starlight is happy when she becomes friends with Trixie, a reformed bad pony just like her, but Twilight is suspicious of Trixie's intentions. Rainbow Dash is thrilled to join the Wonderbolts, but a mistake during training leads to a hurtful nickname that she desperately tries to change. 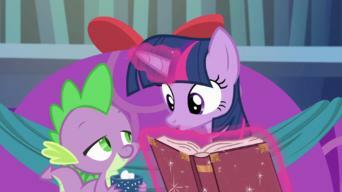 When Starlight is sad on Hearth's Warming Eve, Twilight reads her a favorite holiday story, a retelling of Charles Dickens's "A Christmas Carol." Rarity opens her new store in Manehattan, but her friends fear that a review of the event will reveal all the problems and mistakes they hid from her. Twilight and Spike agree to perform Applejack's farm chores so she can get a much-needed spa visit, but Applejack ends up fixing the spa's plumbing. Fluttershy convinces her younger brother Zephyr to move out of their parents' house, but then he moves in with her and avoids doing any work. 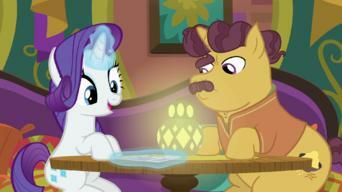 Pinkie Pie and Rarity try to help when the Tasty Treat, an Indian restaurant, is failing due to conflict between the owner and his daughter, the chef. At a fan convention, Rainbow Dash gets swept up in a dangerous Daring Do adventure with Quibble Pants, a pony who thinks the whole thing is a fantasy. It's time for the annual Applewood Derby. Each foal asks a pony to help, but when the older assistants take over, the fillies feel left behind. When Rainbow Dash overdoes it with the pranks, the other ponies wonder if there's a way to give her a taste of her own medicine. When a changeling has everyone in the Crystal Empire scared, Spike risks his reputation to prove to the others that not all changelings are mean. When Spike and Big Mac invite Discord over to play a fantasy board game, the friends learn they have very different ideas of how to have fun. Fluttershy and Pinkie Pie find that their talent for playing buckball disappears when Applejack and Rainbow Dash pressure them to beat Appleloosa. An enthusiastic griffon named Gabby is eager to earn her own cutie mark, but the Crusaders aren't sure that's even possible for non-ponies. The Cutie Map sends Applejack and Fluttershy to flashy Las Pegasus, where they try to discover why Flim and Flam aren't getting along. With too many things to do and not enough time to do them, Starlight Glimmer tries using her magic to take on several friendship lessons at once. After Rarity, Applejack and Pinkie Pie return from a disastrous boat trip, Twilight Sparkle hears three very different versions of what went wrong. After Apple Bloom is caught in a lie, Applejack shares how her own habit of stretching the truth used to get her in trouble back when she was a filly. Twilight Sparkle and Rainbow Dash are summoned to Wonderbolt Academy, where two young trainees need a few lessons on flying and friendship. When her friends treat her strangely after she returns from a trip to her old village, Starlight Glimmer uncovers a wicked plot against Ponyville. To save Equestria, Starlight Glimmer must find her confidence while leading her friends into a dangerous battle with Queen Chrysalis. Season 7 of My Little Pony: Friendship Is Magic has 26 episodes. Because different Netflix countries have different availability for episodes, you'll need to check the episode listing below to see which are available in Portugal. Unsure of how to guide Starlight Glimmer, Twilight Sparkle turns to her own mentor, Princess Celestia, for advice. When Trixie accidentally loses Twilight's Friendship Map while practicing magic, Starlight performs a spell to contain Twilight's anger. Twilight finds herself overwhelmed when she adds yet another challenge to an already busy day: babysitting her little niece, Flurry Heart. Hoping her rock-scientist sister Maud might move to Ponyville, Pinky Pie aims to show her that there's more to the town than its selection of rocks. Fluttershy realizes her dream of opening an animal sanctuary but must learn to be firm when her assistants run with their own ideas. Rarity is excited to spend a day with her little sister, Sweetie Belle ... not realizing Sweetie Belle has outgrown all the activities she's planned. Rainbow Dash is embarrassed by her parents' overenthusiastic support, but Scootaloo helps her come to an important realization. When the Cutie Mark Crusaders learn that Big Macintosh has a crush on a sweet pony named Sugar Belle, they go all out to help Mac win her affections. Applejack agrees to be a judge for Rarity's fashion show, but her bluntly honest opinions offend the designers and threaten to ruin the event. Royal sisters Celestia and Luna are feuding, so Starlight decides to swap their cutie marks to help the princesses learn some appreciation. Pinkie Pie visits Yakyakistan for a fun holiday event. When an avalanche covers the village, Pinkie sends for help despite the yaks' proud objections. Discord invites Fluttershy to tea in his realm for the first time, but he worries that it's too chaotic and begins changing his home and himself. Apple Bloom and Applejack hope to fix a longstanding feud between the Apple and Pear families by reuniting a grandparent from each side. Twilight publishes her friendship journal, hoping that its lessons will inspire others. But readers just end up bickering over which pony is best. Spike mistakenly invites Ember and Thorax to visit Ponyville on the same day, then scrambles to keep them apart for fear they won't get along. Pesky Fly-ders nearly ruin the Cutie Mark Crusaders' big sister/little sister camping trip, until the older ponies relate tales of inspiring legends. Trixie and Starlight meet Thorax's brother Pharynx, a changeling unwilling to transform, and feel compelled to help the hive accept Pharynx as he is. When Rainbow Dash learns that her favorite author is retiring, she's determined to change the writer's mind. 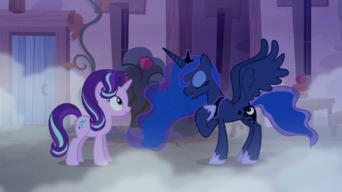 Rarity is devastated when her mane is ruined just before a photo shoot. But a confidence boost from her friends inspires her to make the best of it. Fluttershy vows to find a cure when Zecora contracts a rare and supposedly incurable disease while helping Fluttershy in the swamp. The Cutie Mark Crusaders open a day camp to help ponies find their talent but are perplexed when young Rumble doesn't want a cutie mark. Twilight's excitement fades about a vacation cruise with her family when she learns it's also a paid meet-and-greet for her fans. Pinkie Pie suspects that Rainbow Dash secretly hates Pinkie's pies, so she aims to uncover Rainbow's deception using the thing she knows best: pies! During a visit from her pal Sunburst, Starlight notices he has lots in common with Starlight's friends and worries she and Sunburst are growing apart. After Sunburst discovers a journal written by Twilight's idol, Starswirl the Bearded, Twilight aims to rescue him from a thousand-year imprisonment. Having released Starswirl and Equestria's other ancient heroes from limbo, Twilight and her friends join forces to conquer the Pony of Shadows. Season 8 of My Little Pony: Friendship Is Magic has 26 episodes. Because different Netflix countries have different availability for episodes, you'll need to check the episode listing below to see which are available in Portugal. When Twilight Sparkle realizes the Friendship Map has grown beyond Equestria, she decides to open a School of Friendship with help from the Mane Six. After her School of Friendship suffers a major setback, Twilight Sparkle must reunite her students and make a few changes. When her sister Maud starts dating a prickly pony named Mudbriar, Pinkie Pie worries their friendship bond may be fraying. Crisis in Ponyville! Rarity leaves Fluttershy in charge of the Manehattan boutique, where the haughty customers are anything but approachable. Desperate to ride a wild rollercoaster in Las Pegasus, Rainbow Dash agrees to serve as chaperone to some older ponies who are heading there, too. A young Hippogriff with relatives on Mt. Aris and in Seaquestria can't decide where to live. It's up to the Cutie Mark Crusaders to help him out. To help celebrate a big anniversary, Twilight Sparkle casts Princess Celestia in a play ... but quickly learns that not everyone is destined to act. Starlight and Sunburst are summoned to their hometown of Sire's Hollow, where they cross paths with their problematic parents. Applejack and Rainbow Dash -- both hoping to win Teacher of the Month -- lead a group of students on a field trip, where things don't go as planned. It's Hearts and Hooves Day, and Big Mac has something special planned for Sugar Belle -- but a mix-up might put a damper on the fun. When Spike starts going through adolescent changes, he worries Twilight Sparkle might kick him out of the castle. Denied admission to the School of Friendship, the Cutie Mark Crusaders do the next best thing and tutor a struggling student. Queen Chrysalis returns with a sinister plan to clone the ponies and take control of the Elements of Harmony. When Twilight Sparkle is called away, she leaves Starlight in charge of the school -- a fact that doesn't sit too well with Discord. As the ponies settle in for Hearth's Warming Eve, a prank threatens to put a damper on the festivities. Twilight learns about another school of friendship and is surprised to see that her idol, Star Swirl the Bearded, is enrolled. Wait, why are they friends again? 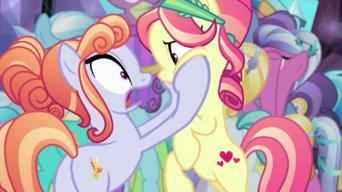 Rarity and Rainbow Dash begin to wonder why they bother hanging out when they don't seem to have anything in common. 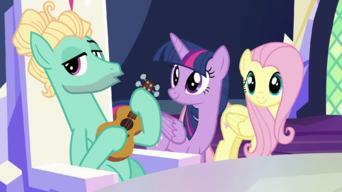 Pinkie Pie is all about her new hobby -- playing the Zenithrash. There's just one problem: She's not very good at it. 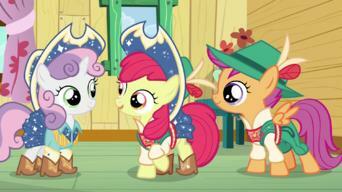 Things get tense when Trixie heads off to Saddle Arabia to perform magic along with her assistant, Starlight. 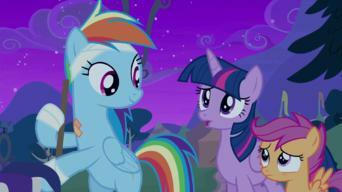 Rainbow Dash worries that Scootaloo's newfound fandom for a group of stunt ponies could mark the end of an era. Twilight Sparkle and the ponies do their best to help Equestria legend Rockhoof adjust to life in modern times. While studying for a big test on the history of magic in Equestria, some of Twilight Sparkle's students stumble upon a secret in the library. 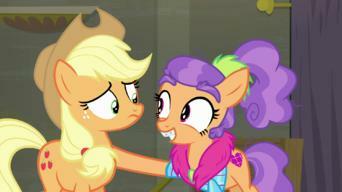 Applejack and Fluttershy take on an unusual Friendship Quest: helping a group of ponies who took a vow of silence. 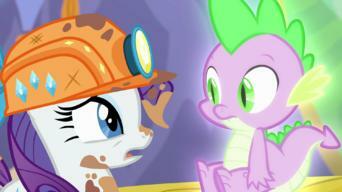 Spike is instantly smitten with a dragon who crash-lands in Ponyville and claims to be his father. Something strange is going on with the magic in Equestria, and Twilight Sparkle and her friends are determined to unravel the mystery. As the plot to take over the School of Friendship kicks into high gear, it's up to the Cutie Mark Crusaders to step up and save the day.